Single in the city and hate to cook (or just don’t have the time for it)? The Rice Guys will deliver hearty ghar ka khana kind of food to your doorstep. And they specialise in meals that are perfectly portioned for one person. The small eatery bang opposite Industry House, specialises in north Indian meals portioned for one person. You can order from a range of curries. We decided to go for the basics, as that’s what defines quality food, and we were fully satisfied! The ‘Ultimate Soul Combo’ is sure to touch your soul with a lehsuni daal, a mildly spiced potato sabji and simple jeera rice (INR 135). If you can’t do without chicken, then go for the non-veg ‘Mad Combo’. It comes with chicken butter masala, dal makhani (not very spicy, has just the right amount of masala), jeera rice, roti, raita and papad (INR 220). We hear that the rajma chawal here is lip-smacking too. The food here is like mom makes, not too heavy or rich – the perfect comfort food. 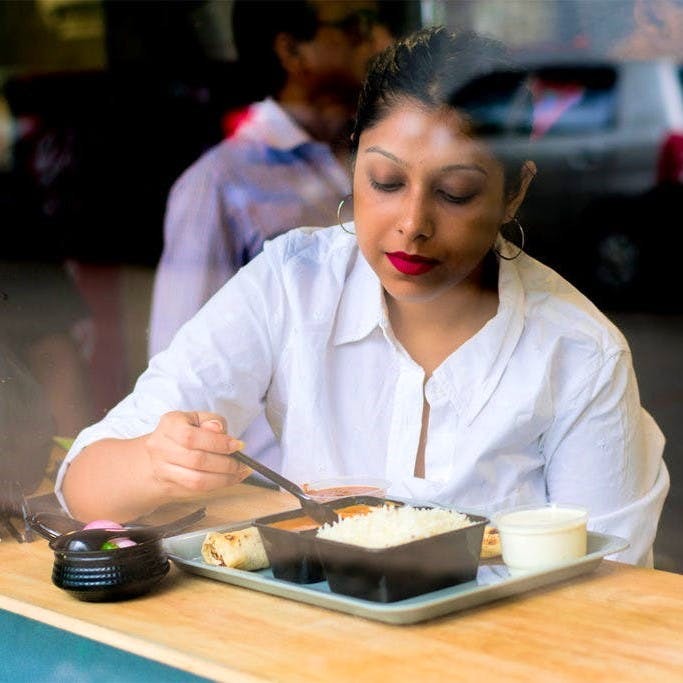 All curries come with steamed rice. The combos have raita and papad included. The raita here is hands down the most creamiest and refreshing I’ve had.